"Star key" redirects here. For the key on a telephone keypad, see asterisk. A Torx T8 screw on a hard disk drive. Torx (pronounced /tɔːrks/), developed in 1967 by Camcar Textron, is the trademark for a type of screw head characterized by a 6-point star-shaped pattern. A popular generic name for the drive is star, as in star screwdriver or star bits. The official generic name, standardized by the International Organization for Standardization as ISO 10664, is hexalobular internal. This is sometimes abbreviated in databases and catalogs as 6lobe (starting with the numeral 6, not the capital letter, G). Torx Plus and Torx Paralobe are improved head profiles. Torx screws are commonly found on automobiles, motorcycles, bicycle brake systems (disc brakes), hard disk drives, computer systems and consumer electronics. Initially, they were sometimes used in applications requiring tamper resistance, since the drive systems and screwdrivers were not widely available; as drivers became more common, tamper-resistant variants, as described below, were developed. Torx screws are also becoming increasingly popular in construction industries. The angle between the plane of contact between tool and fastener and the circumferentially directed force is much closer to 90º in a Torx type of head (lower) than in a conventional hex head (upper). 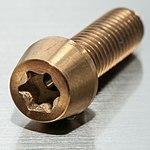 By design, Torx head screws resist cam-out better than Phillips head or slot head screws. Whereas the tendency of Phillips drivers to cam out under excessive torque has been listed as a feature preventing damage to the screw-head or driver, Torx heads were designed to prevent cam-out. The development of better torque-limiting automatic screwdrivers for use in factories allowed this change. Rather than rely on the tool to slip out of the screw head when a desired torque level is reached (which risks damage to the driver tip, screw head, and/or workpiece), torque-limiting driver designs achieve a desired torque consistently. The Torx design allows for a higher torque to be exerted than a similarly sized conventional hex socket head without damaging the head and/or the tool. The diagram depicts the interaction between the male and female components of a conventional hex drive and a Torx drive. The clearance between the components is exaggerated for clarity. The green circle, passing through the six points of contact between the two components, represents the direction of the rotational force being exerted at each of those points. Because the plane of contact is not perpendicular to this circle, a radial force is also generated which tends to "burst" the female component and "crush" the male one. If this radial force component is too great for the material to withstand, it will cause the corners to be rounded off one or both components or will split the sides of the female part. The magnitude of this force is proportional to the cotangent of the angle (depicted in orange) between the green circle and the contact plane. For the Torx type of design, the angle is much closer to 90º than in the case of the hex head, and so for a given torque the potentially damaging radial force is much lower. This property allows the head of the fastener to be smaller for the same required torque, which can be an advantage in applications where space to accommodate the head is limited. 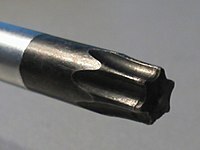 The disadvantage on older Torx heads is that the smaller internal "splines" can corrode relatively easily and cause the Torx driver to slip and damage the head, making it more difficult to remove than the traditional hexagon head. Torx head sizes are described using the capital letter "T" followed by a number ranging from T1 to T100. A smaller number corresponds to a smaller point-to-point dimension of the screw head (diameter of circle circumscribed on the cross-section of the tip of the screw driver). Common sizes include T10, T15, and T25, while T5.5, T35, and T47 tend to see specialized use. Only the proper driver can drive a specific head size without risk of damaging the driver or screw. The same series of Torx drivers is used to drive SAE, metric and other thread system fasteners, reducing the number of bit sizes required. The "external" variants of Torx head sizes (see below) are described using the capital letter "E" followed by a number ranging from E4 to E44. The "E" numbers are different from the "T" numbers of the same size: for example, an E4 Torx socket fits a T20 head. 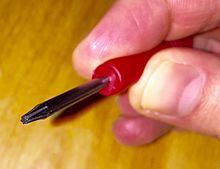 A version known as Security Torx, Tamper-Resistant Torx (often shortened to Torx TR) or pin-in Torx contains a post in the center of the head that prevents a standard Torx driver (or a straight screwdriver) from being inserted. An External Torx version exists, where the screw head has the shape of a Torx screwdriver bit, and a Torx socket is used to drive it. The external “E” Torx nominal sizing does not correlate to the “T” size, (e.g. an E40 socket is too large to fit a T40 Torx bit, while an E8 Torx socket will fit a T40 Torx bit). A Torx successor, Torx Plus, was introduced about 1990 when the original Torx patent was expiring. The lobes are more square to allow for higher torque and to minimize wear. The name is shortened to IP (Internal Plus) with sizes ranging from 1IP to 100IP  (sometimes listed as IP1 to IP100 ) and EP (External Plus) with sizes ranging from 1EP to 42EP as well as smaller sizes ranging from H7EP to H2EP and includes five-lobed tamper-resistant variants. The specifications for these licenses are held by Textron. Standard Torx drivers can be used to drive Torx Plus screws, but not to full torque because of the loose fit. Torx Plus drivers will not fit into standard Torx screws. A tamper-resistant version of Torx Plus exists having five lobes rather than six, plus a solid post in the center, and is used for security as the drivers are uncommon. Though Acument (formerly Textron) lists no designation, TS  or IPR  may be seen. Torx Plus Maxx Stems is a highly specialized variant used on the ends of fastener opposite the bolt-head, and provides higher torque than other drive systems allow. Torxstem is a stud with the Torx Plus Maxx drive on both ends. A modified version of Torx called Torx TTAP was developed in 2005, which features a second recess to create a "stick-fit" engagement, designed to minimize wobbling without the need for magnetic bits, a feature that can be important to certain industrial users. Standard Torx drivers can be used to drive TTAP screws, but TTAP drivers will not fit standard Torx screws. AudiTorx is a tamper-proof fastener where a concave and smooth fastener head is topped with a break-away Torx drive that snaps off when the engineered torque is reached, leaving a rivet-like bolt head that can't be easily removed. The main application for these fasteners is in the railroad industry. AW drive is a similar hexalobular type screw head to Torx, with a tapered profile to aid in centering, developed by the Würth Group in Germany. Available in five sizes: AW 10, AW 20, AW 25, AW 30 and AW 40. ^ Camcar eventually became part of Textron Fastening Systems in the 1990s. In 2006 Textron Fastening Systems was sold to Platinum Equities, LLC, of Beverly Hills, California. They renamed the company Acument Global Technologies, which as of 2010 includes Avdel, Camcar, Ring Screw, and others. In 2014, Acument was sold from Platinum Equity to Fontana Gruppo. ^ "US Patent #2,474,994 Claims, Page 7". ^ a b c d e "Chart of Torx fasteners and tools". Wiha Tools USA. Archived from the original on 2015-12-26. Retrieved 2012-01-14. ^ a b "TORX Drive System" (PDF). Textron Fastening Systems. Archived from the original (PDF) on 2007-01-02. ^ "16pc torx bit set". Amtech Tools. Retrieved 24 February 2017. ^ "2 Pcs T35 3/13 Torx Head Screwdriver Link 1/2 Square Mechanic Drive Socket". ^ "FTX47E, Socket Driver, TORX, GM-Style, T47". ^ a b "TORX PLUS Drive System" (PDF). Acument. ^ "TORX PLUS Long arm L-Keys". Wiha Tools USA. Archived from the original on 7 October 2015. Retrieved 14 July 2016. ^ Egon Pavlis (16 March 2010). "When a Phillips is not a Phillips Plus So Much More!". Instructables. ^ "Fastening Solutions" (PDF). Acument. ^ "Tamper-Resistant TORX PLUS Drive System" (PDF). Textron Fastening Systems. Archived from the original (PDF) on 2006-11-10. ^ "TS Star Bits (5 Sided) 1/4"D 7pc - Part No. 3389 - Part of the TS Star/Torx* Plus range from Laser Tools". Retrieved 14 July 2016. ^ "Security TORX PLUS Insert Bits". Wiha Tools USA. Archived from the original on 13 December 2015. Retrieved 14 July 2016. ^ "TORX PLUS® MAXX Drive System". ^ "TTAP Fastener". Acument Global Technologies. Retrieved 26 February 2017. ^ "Torx TTAP Advantages". TTAP Drive AS. Retrieved 26 February 2017. ^ "Acument Industrial fastening systems". ^ "Technical Information on Fasteners: Design recommendations 11.1 Inside drives for screws – AW drive (AW-Antrieb)" (PDF). Adolf Würth GmbH & Co. KG. Retrieved 2 March 2017. ^ "Construction Range Overview (Fasteners: Introducing the AW Drive System, p3)" (PDF). Würth New Zealand. 2016.